Campbells Creek is a township 4 km south of the centre of Castlemaine, connected to Castlemaine by the Midland Highway and the railway which runs to Maryborough. Campbells Creek was named after William Campbell, pastoralist and politician. Campbell took up a small pastoral run, Tourello, near Clunes. In 1850 Campbell discovered gold on his brother-in-law’s neighbouring property, entitling him to a reward as Victoria’s first gold discoverer. 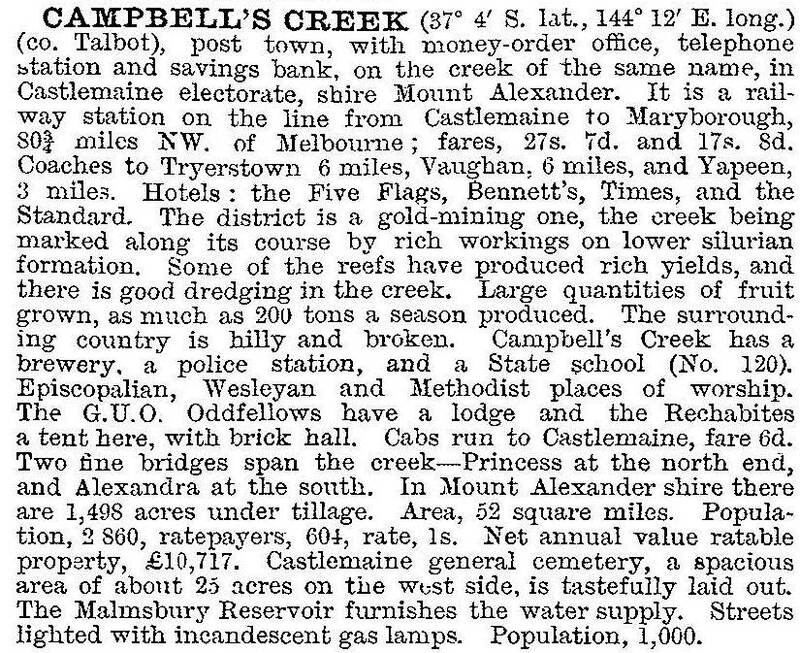 Gold was discovered at Campbells Creek in 1851, being part of the Castlemaine-Mount Alexander gold field. The creek itself is fed by the Barkers and Forest Creeks in Castlemaine, and joins the Loddon River at Guildford. A school was opened in 1854. Wesleyan and Primitive Methodist churches were opened in 1856 and the latter, along with the Presbyterians, ran schools until the 1870s. Several hotels were opened in Campbells Creek, the best known being Five Flags. By the end of the 1850s much of the alluvial gold was worked by Chinese miners, and companies were formed to exploit the auriferous quartz reefs. In 1865 Bailliere’s Victorian gazeteer recorded five quartz-crushing mills, eight hotels and a brewery. Almost the whole stretch of Campbells Creek was dredged between 1902 and 1942. Despite the decline of mining Campbells Creek’s local economy has been able to rely on a diversity of industries – fruit growing, cordial factory and furniture factory at various times. It has a wide range of recreational facilities – swimming pool, golf course, bowling green, tennis courts and a sports oval and complex. There are also a State primary school (114 pupils, 2014), the Olivet Christian College (1979) and an elderly persons’ centre. East of the town there is forest with old gold workings and scenic walks. On the other side is the heritage-registered Castlemaine cemetery, which contains a Chinese section. The Mount Alexander council introduced new heritage controls in 2011 over the shire including a heritage overlay that included the Campbells Creek Avenue of Honour.